The Federal Government has made it mandatory that every Nigerian must have a National Identification Number (NIN). To achieve this, all data generating organisations have been directed to harmonise their databases with the National Identity Management Commission (NIMC), whose mandate it is to implement the National Identity System in Nigeria. 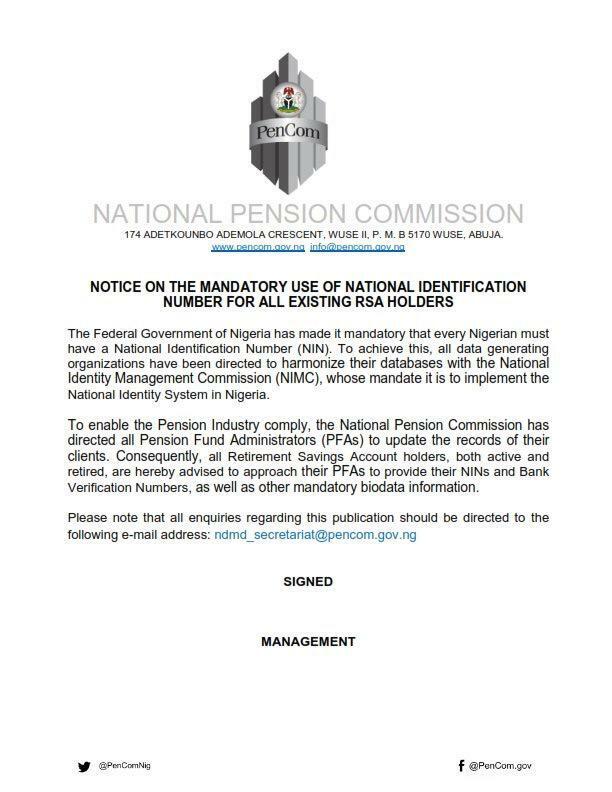 To enable the Pension Industry comply, the National pension Commission has directed all Pension Fund Administrators (PFAs) to update the records of their clients. Consequently,, all Retirement Savings Account holders, both active and retired,, are hereby advised to approach their PFAs to provide their NINs and Bank Verification Numbers, as well as other mandatory biodata information.